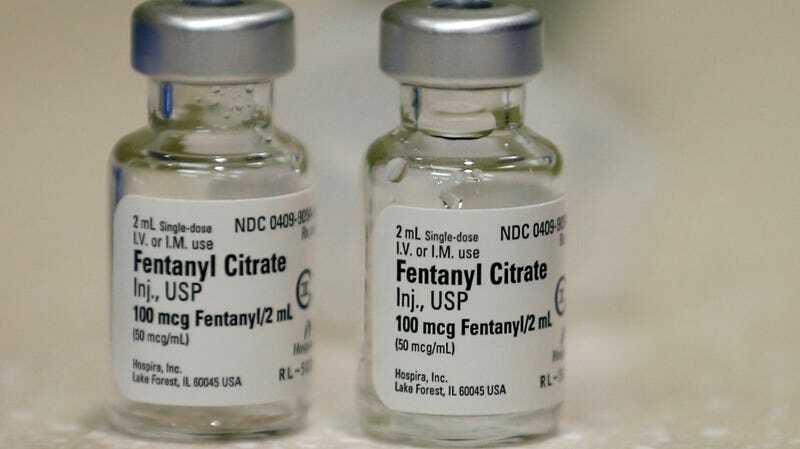 Last Saturday, police in Chico, California reported that 13 people in the same house were involved in a mass drug overdose, possibly involving the powerful opioid fentanyl, with at least one person dying as a result. The case is undeniably tragic. But some of the details reported by the Chico police and uncritically repeated by the media reinforce a myth about the dangers of accidental exposure to fentanyl—and this stoking of unnecessary panic could put people at risk if first responders become too afraid to make physical contact with a suspected overdose victim. In a press conference held Saturday, Chico police chief Michael O’Brien reported that officers were dispatched to the house on Saturday morning. They, along with members of the Chico Fire Department, attempted to revive several people who had lost consciousness, using CPR and the opioid overdose antidote naloxone. One man was pronounced dead at the scene, while 12 were admitted to the hospital, four of whom were in critical condition (some have since been released). At this point, it’s strongly suspected the people at the house had overdosed on fentanyl and possibly some other drug. O’Brien also reported that two officers initially on the scene told firefighters they had begun to “feel some effects” from being exposed to fentanyl. They were subsequently taken to the hospital but later released in good condition. Afterward, the house was declared a hazmat site, seemingly out of a fear of further exposure. The Chico Police Department has not responded to a request for comment from Gizmodo. O’Brien told CBS13 on Monday that “It doesn’t take much [fentanyl] to cause exposure. It can be absorbed through the skin, you can breathe it. All those types of things, so it’s very very dangerous, not like heroin.” The trouble is, this isn’t exactly true. Fentanyl and other synthetic opioids like carfentanil are indeed more potent than naturally derived opioids like heroin or morphine, making the risk of a fatal overdose more likely. And the availability of illicit fentanyl has largely driven the opioid crisis in recent years. In 2017, for instance, around 50,000 people died from an opioid overdose in the U.S., with more than half of deaths involving synthetic opioids. But doctors like Ryan Marino, a medical toxicologist and emergency medicine physician at the University of Pittsburgh, have long bemoaned the kinds of warnings about fentanyl voiced by O’Brien. And he’s similarly critical of cautionary tales involving law enforcement officials who allegedly become sick from simply touching fentanyl or breathing near the drug. Earlier this month, for instance, two Missouri officers were also sent to the hospital after they stopped a driver whose car contained fentanyl and one came into contact with a broken pill. Though it’s understandable why people are scared of fentanyl exposure, this fear mongering could have dire consequences. “The reason this is a problem is because in a situation where people are actively in need of resuscitation (like the scene found in Chico), the people responding can hesitate to immediately and appropriately perform lifesaving interventions due to fear of such contagion, and instead delay to prepare hazmat response,” Marino said. Fentanyl is typically snorted as a powder, smoked, or injected when bought off the street (oftentimes, though, people are led to believe they are actually using heroin or another less potent drug). It can also be prescribed legally as a dermal patch that attaches to your skin. But according to Andrew Stolbach, a emergency medicine doctor and medical toxicologist at Johns Hopkins Medicine, it’s close to impossible that a person could become sick from briefly touching a patch. The patch releases a small dose of fentanyl slowly over the course of three days. And while people have overdosed on patches, it’s usually because they’ve found ways to siphon out the fentanyl and take it in ways not intended by the manufacturers. Neither Marino nor Stolbach doubt that the Chico officers felt sick. But symptoms of an opioid overdose are specific, such as slowed breathing, blue skin, and shrunken pupils. Conversely, stories of first responders becoming sick from fentanyl exposure usually feature vague, even contradictory symptoms like a racing heartbeat, dizziness, or feeling sweaty. Often, as appears to be the case with the Chico officers, the symptoms disappear much quicker than the symptoms of a typical overdose would. “If you’ve been told that a drug sitting on your skin could kill you, and then you see that drug sitting on your skin, it’s not unreasonable to suddenly feel anxiety and unwell,” Stolbach said. The position statement was intended to dispel overwrought fears of accidental fentanyl exposure and educate police departments and emergency responders. But while Stolbach has noticed an uptick in awareness of these myths in the medical world, the same can’t necessarily be said for law enforcement or the media. Just last October, for instance, the AP was forced to issue a correction of a story that originally warned readers that skin contact with a dose of fentanyl as small as a grain of a salt could be deadly. According to the ACMT and AACT, a simple pair of disposable, non-latex gloves should be protection enough for first responders. If you’re in an especially windy room with fentanyl powder nearby, then a basic mask might be useful too. Perhaps more than anything else, Marino said, these myths keep our attention away from the lives that are genuinely being impacted by fentanyl.